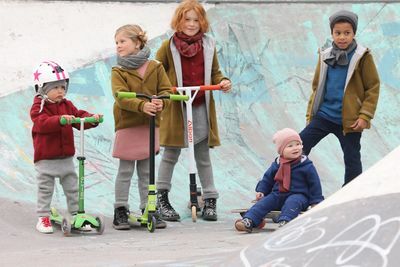 Baby and children’s textiles made of natural fabrics – with this idea Imma and Dietrich Sautter founded our company more than 30 years ago. What started with a washable nappy system developed into a versatile and exceptional assortment of children’s and home textiles. However, the idea always stayed the same. At our production site, centuries-old handicrafts often meet modern machinery. Innovative technologies and nights of puzzling over problems are often necessary to design new products or improve existing manufacturing processes. We rely on the ideas, the handicraft skills and the enthusiasm of the people working with us to constantly develop disana. In this way our small family business has turned into a highly innovative mediumsized company. Our articles are still “made in Germany”. More precisely at our factory in Lichtenstein, a small community south of Stuttgart. Almost all production steps are completed in-house. Thanks to the work in our embroidering, cutting and sewing departments, we are currently providing 25 jobs – and new additions are made each year. And even in the areas in which we cannot manage the workload alone because we do not have the machines or enough capacity, we rely on German workmanship. This is taken over by contractors and suppliers which we have known for years, most of them located in close vicinity, hardly a stone’s throw from our factory. On-site production not only guarantees our articles’ high quality, it also enables us to react to our customers’ wishes quickly and flexibly. Many of our customers’ ideas and suggestions have soon gone on to be used in disana articles. We also rely on the highest quality when it comes to raw materials. Almost all of our suppliers have accompanied us for many years – in plenty of cases since disana’s starting days. Therefore they are well aware of our high demands with respect to the raw materials, unfinished goods and services we commission. They know that for us, the best supplier is not the cheapest one, but one we can rely on 100%. While we are down-to-earth and locally committed when it comes to producing our goods, our disana customers are a colourful mixture and very international. Today, disana articles are sold in more than 50 countries around the globe. Sometimes we ourselves are amazed at where we are sending the packets with our jackets, blankets or nappies. That certain something Our employees are the most important factor for producing our disana textiles beside the chosen organic raw materials. Only their knowledge, their skills and their craftsmanship make a disana product that is fit for a king out of a thin yarn or a piece of fabric..
Modern working stations, which are bright, friendly and ergonomic are not the only things our employees like in our new facility. Disana offers a lot of extras for their workers. All employees that come to work with public transportation get their costs back. Everybody who rides a bike on its way to work, receive per year one free inspectional service for their bike. Workers who drive together in one car also get some support to minimize traffic and the demand of parking places. Health is not only important for our textiles. Disana offers two times a week fresh fruits from an organic store and soft drinks. Those who want can join our TaiChi – group and the neighboring physiotherapist help us to avoid tensions with showing us correct poses. Additionally disana will create a “playground” as the Californian companies have it with a beach volleyball field and a slag- line for more diversion. Exactly those certain somethings that shall don’t let miss out the fun at work. With our production in Germany, disana especially stands for high ecologic and social standards. But what to do, if the own facility becomes too small? Already for two years now we think about how to increase our company. This year, mid of May, it was finished! The whole disana production – our knitting dept., our cutting dept., the sewing dept., quality control and the packing dept. – moved into new facilities. Only 5km far away from the old facility, we could rent a production hall from an old spinning facility. We equipped it to our ideas and after many weeks with cleaning, renovating and constructing, our employees and machines could move into their new home. What a huge step for our small company! We moved from 800 qm² surface to 3.000m². Still today we’re looking at each other and can’t believe how much space we have now. Every knitting machine is now accessible from each side and can be faster equipped with yarn. Every sewing machine was fixed into a big table, which offers much space for working and piling the goods. There are open spaces for parking the products, bring them from one place to another and we have a big warehouse for our raw materials and finished products. For us, this is a new way of work and this will impact on our products and their quality, because the things which are produced with fun at work become twice as nice and good. Enjoy the following survey through our new production.